← Does God Turn a Deaf Ear? Just after Jesus sent seventy laborers into the fields to reap a harvest for His kingdom Jesus spoke these words. When we look into our world today, after two thousand years of the churches labor in the fields, we rejoice over all of the progress that has been made. However, this truth still remains today-the harvest is plentiful, but the laborers are few. When we look at the statistics of the America church we see a frightening truth. The harvest is multiplying while the laborers are decreasing. According to Thom Rainer, the CEO of Lifeway, Southern Baptist churches lost a little over one hundred thousand members last year and have had the lowest amount of baptisms since 1948. Unfortunately, in 1948 there were only six million Southern Baptist, today there are more than sixteen million. While this study was made specifically for the Southern Baptist Convention we realized that the statistics are not much different for most other denominations; some are much worse. Looking at the vastness of the unreached people and the lost condition of our nation can be overwhelming. Truly the harvest is plentiful. When we look at how unreached our nation is for the Lord we shouldn’t be surprised at how wicked it has become. Lost people will act like lost people. However, our nation isn’t lost because we have fewer church members. It is lost because we have fewer church members laboring for the Lord. We cannot blame the world for its lost state, for, it is the church that Jesus commissioned, giving it power and authority, to go out and share the gospel across the globe. Within the walls of the church most are discouraged with the entitlement society that is rapidly growing in our nation, not realizing they have created an entitlement society within the church itself. We go to church wanting to be blessed, but will not return a blessing. We go to church wanting to receive, yet we have no goal to give. We go to church wanting to be fed, although have no heart to feed. The problem with this is, God doesn’t call us to go to church, He calls us to be the church. What then is the solution to this devastating and deadly problem? Jesus made it clear; we are to beseech the Lord of the harvest. We are to pray for God to send workers into His fields. We need to stop fussing about the problems and start seeking the solution by praying that God would send out the gospel seed sowers along with the harvesters out into the fields. Set aside a daily time to pray for God to send workers into the field. Set aside a day or a weekend dedicated to praying for this need. 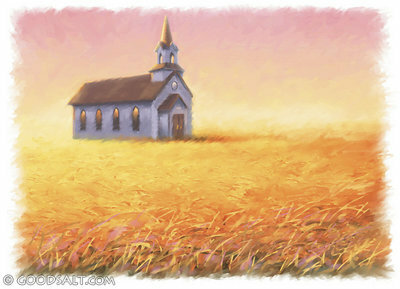 If there are ministries in your church that are shorthanded, beseech the Lord of the harvest. Don’t stop praying until you see God stirring. Once you see God stirring, pray some more. Yes we need to pray for the sinner that God would draw them unto Himself, yet at the same time, “How then will they call on Him in whom they have not believed? How will they believe in Him whom they have not heard? And how will they hear without a preacher?” (Romans 10:14). Pray! Keep in mind though; when you begin to pray, the first one God will begin to move will more than likely be you.